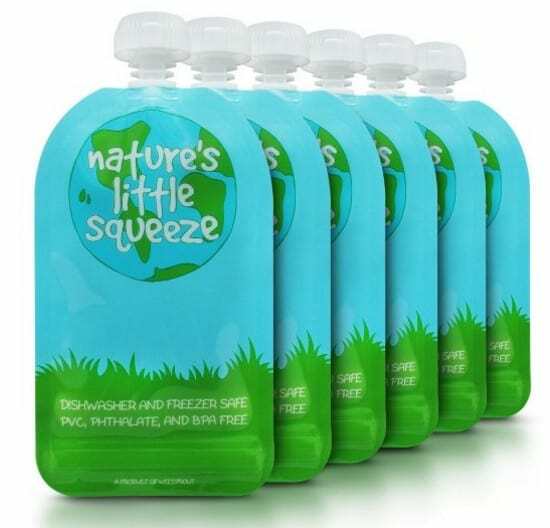 The Reusable Food Pouch (6-Pack) is on sale for $16.99 at Amazon right now. That's 32% off the list price of $24.99! Perfect for homemade baby food! EASY TO FILL AND CLEAN: Extra wide zipper-opening makes filling and cleaning easy. When cleaning, water flows through the zipper opening and out the spout. There are no pesky corners to trap food. DISHWASHER AND FREEZER SAFE: Pouches are top rack dishwasher safe. For best results, rinse before loading in dishwasher. Fill and store extra pouches in the freezer. Earth's clear continents on back side reveal pouch contents. HIGH QUALITY CONSTRUCTION: Strong, eco-friendly materials allow for repeated use. Dual-zipper closure ensures against leaks. BPA, PVC, lead and phthalate free. REUSABLE AND RECYCLABLE: Refillable pouches can be used again and again. Save money and natural resources, compared to disposable pouches. Packaging and pouches are recyclable. THE BEST GUARANTEE: The ONLY reusable food pouch backed by a 1-year, hassle-free guarantee. See all posted baby deals or all posted Amazon deals to save even more!